Artist/maker unknown, American. Printed by G. M. Whipple & A. A. Smith, Salem, Massachusetts. During the Civil War, both the North and the South used envelopes as a medium for disseminating propaganda; in some cases half or more of the envelope was covered with an illustration, usually a caricature. 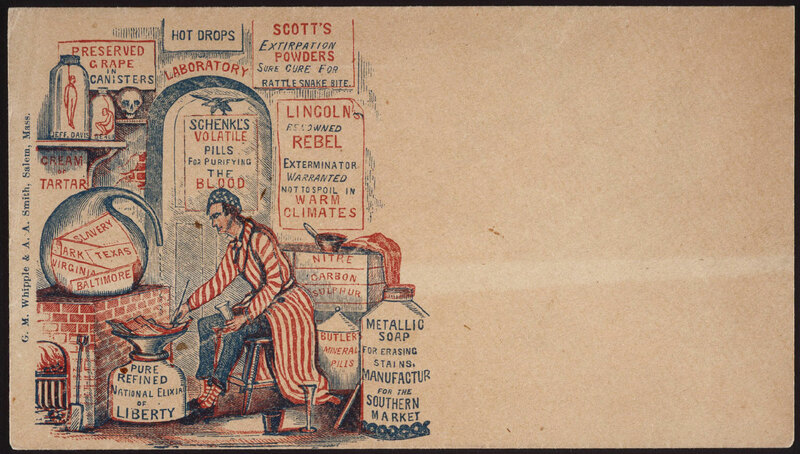 In this multicolored example, Abraham Lincoln is at work in his laboratory, distilling off slavery from a mixture of Confederate states and cities to produce a "Pure Refined National Elixir of Liberty." Among the signs in the laboratory are several advertising medicines with the names of Lincoln's officers, including "[Robert Kingston?] Scott's Extirpation Powders Sure Cure for Rattlesnake Bite" and "[Benjamin] Butler's Mineral Pills." There is also a jar within which an effigy of Confederate President Jefferson Davis is hung. William H. Helfand, from The Picture of Health: Images of Medicine and Pharmacy from the William H. Helfand Collection (1991), p. 128.